Catch Jadeja’s amazing direct-hit in Pakistan’s fall of wickets here. Across all departments of the game, Ravindra Jadeja is steadily turning out to be one of India’s most valuable cricketers at the moment. The 28-year-old’s incredible match awareness was on display during the high-pressure Champions Trophy clash against arch-rivals Pakistan at Edgbaston. 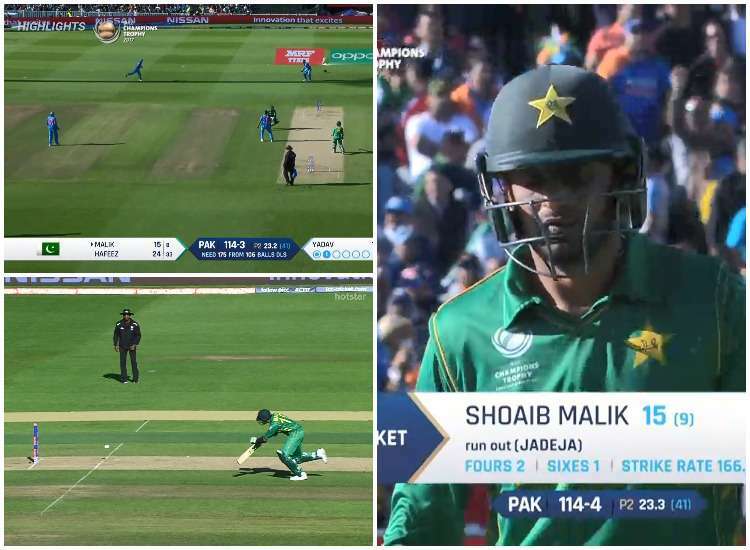 In what was a swift pick-up and throw, Jadeja almost completed both acts in one motion and unleashed a direct hit to help India see the back of Shoaib Malik. The stunning fielding display went a long way in extinguishing Pakistan’s hopes of a miraculous recovery. Following India’s powerful performance with the bat and the aftermath of frequent rain-enforced interruptions, Pakistan found themselves chasing 289 runs from 41 overs. With the pitch rewarding disciplined bowling and their traditional difficulty at run-chases, they had a stiff task on their hands. The usually sedate Azhar Ali looked to force the initiative by targeting the boundary during the Power Play overs. However, his batting partners at the other end struggled to get going and sent the required run-rate in the wrong direction. The likes of Ahmed Shehzad, Babar Azam and Mohammad Hafeez were unable to tackle the threatening Indian bowling attack. After the pacers accounted for Shehzad and Azam, Jadeja coerced Azhar into a mistimed shot and reduced Pakistan to 91/3. Upon arriving in the middle, Malik made his intentions pretty clear. The 35-year-old smashed Hardik Pandya for successive fours. Malik proceeded to dance down the track and deposited Jadeja into the stands. Suddenly, the slew of boundaries seemed to cause a concern or two in the Indian camp. However, the metronomic spinner had the last laugh as his rocket arm sent the seasoned right-hander packing. During the third delivery of the 24th over, Umesh Yadav stifled Malik by aiming one at the stumps. The batsman responded with a defensive nudge and inexplicably set off for a non-existent single. But Jadeja was lurking at backward point. Swooping in on the ball like a hawk, the left-armer smartly picked it up and rapidly unfurled a throw in the vicinity of the stumps. His strong arm coupled with the stellar accuracy of his judgement resulted in a direct hit. Even though he was sent back by Hafeez, Malik was late in getting to safety. As the ball rattled the woodwork, Malik was caught well short of his crease. 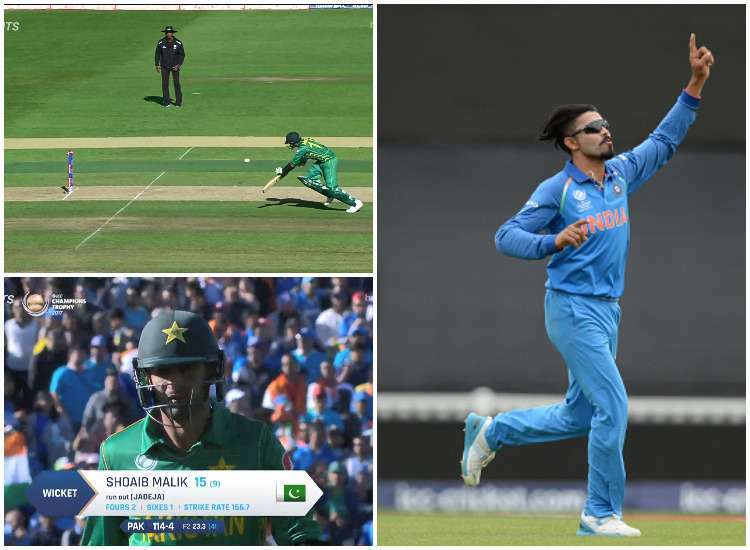 Despite the umpire being inclined towards sending the decision upstairs, Malik started walking back to the dressing room upon knowing that he had not made it. Apart from the almost instantaneous pick-up and throw, the highly commendable aspect of the left-armer’s effort was the fact that he was not in a position which gave him a full set of stumps to aim at. Following Malik’s departure, Pakistan surrendered meekly and were bowled out for 164. India had coasted to a comprehensive 124-run victory. This was not the first instance of Jadeja’s brilliance on the field changing the complexion of the game. He had previously shown his propensity for direct hits during the recently completed edition of the Indian Premier League.